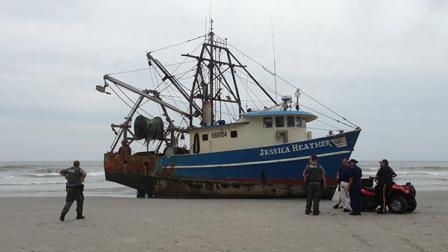 A 56-foot fishing boat ran aground near Caesar's Pier in Atlantic City. The boat named Jessica Heather hit the beach after midnight near Missouri Ave. Some reports are that the captain apparently fell asleep while it was in autopilot. A 100-yard perimeter was setup around the boat, which had become a curiosity throughout the day among beach goers. The Coast Guard had to wait until high tide to try to refloat the vessel, which has now been put back in the water. An investigation will continue into why the boat was beached. Police are searching for a man who assaulted an police officer in the Target store in the Port Richmond section of Philadelphia. It happened around 5:30 p.m. Monday on the 2700 block of Castor Avenue. The man fled the store after pepper spraying the officer. The suspect is described as a white male, around 6'1”, with a full beard, short hair, and a full-sleeve tattoo. He was wearing a white and blue striped shirt and blue jeans. The suspect fled in a purple Chrysler minivan. The officer was treated at Episcopal Hospital. The investigation continues. 30-year-old Ummad Rushdi is charged with kidnapping his girlfriend's 7-month-old son Hamza Ali from his family's home in Upper Darby. His preliminary hearing was delayed today until September 9th. Police have been searching for the missing baby everywhere between Upper Darby and Rushdi's home in York. Hamza is presumed to be dead, but homocide charges have not yet been filed. Both sides, defense and prosecution, are preparing for the possibility that this will become a capital murder trial with death penalty implications.